Whole Horse Connection – Improving the well-being of horse and rider through a variety of scientifically based therapies. Improving the well-being of horse and human through a variety of scientifically based therapies. The horse is a natural grounding entity. When one learns to be mindful in the presence of the horse, the horse provides instant feedback to the people around them. Horses have the ability to help regulate the troubling emotions that have become a problem for the people experiencing them. Equine Assisted Therapy involves a client, a facilitator, and one or more horses in an arena type setting. The facilitator offers suggestions to the client in regards to communicating with the horse. Once the horse has “hooked on” to the client, the facilitator steps away and allows the horse to continue the session. The Masterson Method (MM) is an integrated, multi-modality method of equine bodywork. It is a unique, interactive method in which you learn to recognize and follow the responses of the horse in order to find and release accumulated tension. Christie utilizes MM in her Equine-Assisted Therapy program to help clients connect on a deeper level with the true nature of the horse. Christie only uses FDA approved therapy devices for horses. These units utilize microcurrent, a scientifically proven method for relieving soreness and muscular tension, backed by over 40 years of research. Several years ago, veterinarians and trainers began experimenting with kinesio-tape on horses and discovered that kinesiology-taping is as effective for horses as it is for humans. By strategically placing kinesio-tape on identified anatomical structures after a bodywork treatment, the horse is able to maintain awareness of the improved range of motion created during the session. By using a variety of therapeutic techniques, a stronger bond can be created between horse and owner making all aspects of riding and training much more satisfying. I enjoy teaching horse owners how to better connect with their horses, and I enjoy coaching individuals who need to find a better connection within themselves find that whole connection through the power of the horse. I am so happy to be able to share insights and wonderful information I find with you. Check back here often for new blog posts! My horses are always happy to see Christie arrive at my barn. Christie takes her time with each one, addressing their individual concerns while working with their very unique personalities. My horses are highly spirited performance horses, and tend to be a bit flighty and quirky, but Christie seems to have the touch that calms them. I would recommend Christie to anyone who wants their horses to feel their best. As a client of Christie’s, I can tell you that her patience with my horses is unmatched. She is calming and comforting to them and to me. She is wonderful at explaining each and everything she is doing for them and why. Christie’s knowledge and calm demeanor will enhance anybody’s experience with these beautiful and majestic creatures. Christie has an amazing ability to read and adapt to any horse in each moment. It doesn’t matter whether it is a high strung, nervous mare or an over the top, playful gelding, she can “see” what they need and offer calm, drama free support. She is also good at communicating with us while she is working so we can gain insights on how we can help our horses stay comfortable when she isn’t around. Christie is truly an expert in the field of equine therapy. She is impressive not only because she is effective with what she does to the horses, but also because she freely shares her knowledge and teaches me techniques that I can do for follow up. 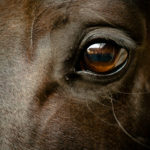 I have not yet met a therapist that is so passionate about helping the horse owners get a clear understanding of what is going on with their horses, and also what they can do to help them. My bond with my horse has increased immensely since working with Christie. 1). Alfalfa Hay: Nadeu (2000) showed that only 50% of performance horses who were fed alfalfa hay vs 83.3% of horses who were not fed alfalfa presented with gastric ulcer lesions. It appears that the high calcium content in the alfalfa helps to inhibit gastric acid. When alfalfa is ingested, calcium absorption is increased, thus consequently, alfalfa hay could be used to prevent and heal gut lesions (Stowers, Waldron, Pryor, Hill & O'brien, 2013). 2). Yeast Addition: Since the welfare of digestive soundness is dependent on the balance of intestinal microbia, it is easy to conclude that microbial imbalances can cause colic or laminitis (Grimma, Pais & Julliand, 2018). Feeding high-grain diets have been associated with dehydration in the colon, which leads to colic and gastrointestinal distress (Blue & Wittkopp, 1981), and laminitis is a consequence of poor fiber fermentation, dehydration of digestive system, gaseous distention and colon displacement. Inflammation of the lamellar tissue in the hoof is a response to these negative factors, thus minimizing these factors by diminishing them and increasing the dosage of viable yeast to enhance the productivity of the digestive system would be far more beneficial. 3). Feeding and Time Management: About 60% of horse owners in the study constantly overfed their horses (Westendorf, Clusters, Williams, Joshua & Govindasamy, 2013). Feeding frequency also affects the gut microbiata, as generally, feeding horses three times a day vs two times a day or once a day significantly increases the protective microbials in the digestive system (Veneble, Fenton, Braner, Reddington, Halpin & Heitz, 2017). 4). Dietary Fatty Acid Supplementation: Diet is a factor that can predispose a horse to lower insulin sensitivity, and it is associated with the occurrence of laminitis, hence supplementation that would increase insulin sensitivity should be the priority to reduce the incidence of laminitis and metabolic syndrome. The direct supplementation of marine oil (algae and fish oil) increased the level of alpha-linoeic acid, arachidonic acid, docosahexaenoic acid, docosapentaenoic acid, and eicosapentanoic acid in the synovial fluid far more than traditional plant based (coconut, flax) concoctions (Ross-Jones, Hess, Rexford, Ahrens, Engle & Hansen, 2014). 5). Pectin: Crop by-products that are rich in pectin have high digestible energy, which will reach the cecum and provide the energy needed for performance and maintenance. Citrus and beet pulp contain high amounts of pectin, as well as other citrus families such as lemon, tangerine and pineapple (Frape, 2008). Good pectin fermentation occurs in the hindgut and thus promotes the viability and positive maintenance of the hindgut system, which is often neglected in the identification and treatment of debilitating ulcers. Conclusion: Dietary characteristics are the main cause of digestive upset in equines. Feeding management, time of feeding, and dietary fatty acid supplementation will assist in avoiding metabolic disorders such as colic, ulceration and laminitis in the performance horse. Following these guidelines will reduce metabolic disorders that are triggered by depression of healthy gut bacteria and inconsistent feeding routines. Blue, M.G. & Wittkop, R.W. (1981). Clinical and structural features of equine enteroliths. Journal of American Veterinary Medicine Association, 179:79-82. Frappe, D. (2008). Nutrion and equine nutrition. Roca: San Palo, p 616. Grimma, P., Pais de Barros, J.P. & Juliand, V. (2010). Impact of diet on bacterial lipopolysaccharides in equine feces and blood. Livestock Sciences, 215: 2-6. Nadeau, J.A., Andrews, F.M. & Matthew, A.G. (2000). Evaluation of diet as a cause of gastric ulcers in horses. American Journal of Veterinary Sciences, 61:784-790. Ross-Jones, T., Hess, T., Rexford, J.M.S., Ahrens, N., Engle, T. & Hansen, D.K. (2014). Effects of Omega-3 long chain polyunsaturated fatty acid supplementation on equine synovial fluid fatty acid composition and prostaglandin E2q. Journal of Equine Veterinary Science, 34:779-783. Stowers, N.L., Waldron, L.A., Pryor, I.D., Hill, S.R. & O'Brien, J. (2013). The influence of two lucerne-based forage feeds. Journal of Applied Animal Nutrition, 2:1-6. Veneble, E.B., Fenton, K.A., Braner, V.M., Reddington, C.E., Halpin, M.J. & Heitz, S.A. (2017). Effects of feeding management on the equine cecal microbiata. Journal of Equine Veterinary Science, 49:113-121. We've heard the claims from the farriers who tout their benefits, but are they really worth the extra cost? While there are horse owners who believe they are worth it- there are an equal amount of those who say that they are not. Even professional trainers, veterinarians, and farriers can be undecided. A new research study on the topic now provides us with the scientific evidence that previously had been lacking from the picture. In this research study, a group of horses were shod for two shoeing cycles, with one front foot having steel nails, and the other front foot having the copper-coated nails. At the end of the second shoeing cycle, the shoes were removed and the solar surface and nail holes were assessed. After analytical assessments were evaluated, it was found that the condition of the nail holes in the hoof were significantly healthier for the copper-coated nails than they were for the steel nail holes. From this evidence it was concluded that "the well-known antimicrobial effects of copper may apply to the application of copper coating of horseshoe nails in reducing the microbial damage to the horses hoof frequently associated with horseshoe nail insertion" (Hampson & Wilson, 2018). This information might be particularly interesting for those who have horses who struggle with chips, cracks and other traumas to the hoof that have weakened the hoof wall structure. These damaged areas allow bacteria to ascend through the keratin tubules of the hoof causing the hoof wall to lose it's healthy elasticity and strength. Add this insult to the fact that horseshoe nails themselves create a shearing stress on the hoof wall, it is not surprising that some of us are left with a horse with not enough foot to nail a shoe on. One more thing to note from this study, it stated that "Practical evidence from farriers indicates that copper may react adversely with aluminum horse shoes, resulting in damage to the hoof wall" (Hampson & Wilson, 2018). While there was no formal evidence on that theory presented, this author feels it something worth considering and discussing with your professional farrier. Boots for Preventing Overuse ­Injuries- or not? It’s a commonly held belief that brush boots can support the large tendons running down the back of horses’ lower legs during exercise. Unfortunately, however, that might not be the case. No research has confirmed this and, biomechanically speaking, it’s difficult to explain how that could even work. It might make us feel like we’re doing something preventive for our horses’ tendons by investing in high-quality boots but, in the end, nothing they wear is likely to stop a tendon or ligament injury from happening. “Brush boots can’t protect the horse from getting overuse injuries, only traumatic injuries,” Roepstorff says. For all the good we hope to achieve through applying wraps and boots to our horses, there’s one important effect that has been scientifically tested—and we still don’t really know whether it’s a good thing or a bad thing. What we do know is that covering the legs with this kind of equipment causes a temperature increase of up to 30%, probably by trapping the heat inside, says Simone Westermann, DrMedVet, of the University of Veterinary Medicine, in Vienna, Austria. Her team’s study results showed that exercising without boots led to very little temperature increase in the legs compared to covered legs. While boots and wraps might have some tendon-warming benefits on very cold days, the temperature increase could be damaging to tendons in certain situations. “It cannot be excluded that heat development under a tendon boot during strenuous exercise could be detrimental to the tendon cells,” she says. The consequence is that you don’t need much of an increase in temperature to reach the breakdown stage. “The main cause for tendon injuries (is) of course the force, but I think the heating effect of boots and bandages could increase risk as well,” says Roepstorff. But don’t panic and throw out the boots just yet. More research is needed to determine the exact advantages, if any, and disadvantages. In the meantime, being aware of the science behind boots and wraps, and recognizing that tradition isn’t always right, is a good start. In 1981, Travell and Simons introduced the "energy crisis theory" in regards to a condition manifested by having reactive trigger points. Have you ever wondered what reactive trigger points are, why they hurt so much, and why they are so exhausting to have? Pain itself is a mentally exhausting condition to endure - but pain caused by chronically contracted muscle fibers is physically draining, as explained through the "energy crisis theory." Active trigger points can be felt as small, hard knots in the soft tissue. These "knots" are an overlapping layers of a muscle fiber(s) that have become stuck together, and no longer have the ability to slide across each other to release and lengthen the muscle. Basically, they are what is holding a contracted muscle in contraction. According to Dommerholt, Mayoral de Moral & Grobi (2006), "The swollen, contracted filaments (fibers) actually get stuck in the Z band because of the gel-like titin molecules ratcheting the fibers in place and preventing detachment." Recent studies of the bioelectrical output of these active trigger points demonstrate that the body discharges electrical frequencies 10-1000 times more than normal to maintain them, so now we see why they can be so exhausting and physically draining. Also, its been shown that these areas are deficient in calcium and ATP. (Quick description of ATP: ATP is the energy containing molecule found in every living cell - it is what holds the energy that fuels all of life's processes. It is known as the "energy currency of life" (Knowles, 1980). To have an abundance of ATP is to have an abundance of wealth- in terms of energy and good health). If you follow the arrows in the second illustration, (sourced from: Starlanyl & Sharkey 2013) you will see how this cycle begins with a stressed muscle fiber releasing excess calcium and bioelectricity into the body, which causes a circulation dysfunction (decreased ATP, decreased circulation in restricted areas, etc), which inhibits oxygen and nutrients from being able to go where they were intended to go- electricity always chooses the path of least resistance, and so will detour around restricted areas. This essentially means that circulating energy will go around the restricted area and take all of it's cargo (nutrients) around with it. Not only does this leave those areas of tissue in a depleted state with no hope of regenerating to full potential, but now the body is using more energy to maintain the braces (knots) that it created around the injured area, which leads to more pain and dysfunction, and more creative compensating mechanisms, which work, until the whole system has a catastrophic break down. This syndrome also explains why it is important to evaluate the condition of the soft tissue when assessing a lameness. Muscle wasting can occur overtime if these restricted areas and active trigger points are not addressed. Many times, after the primary cause of an injury is relieved, the horse will still be "off" because the compensatory braces within the tissues surrounding the original injury have not been released. Unfortunately, it will never occur to the horse to perform their own rehab exercises and stretches throughout their healing process, and so they get conditioned to believing that their limb only goes so far- and they do not have the cognitive ability to "think" about making it reach further. It takes a skilled physiotherapist to identify and address these remaining compensatory patterns in order to restore the correct functional range of motion and proper locomotion in their gait. Knowles, J. R. (1980). "Enzyme-catalyzed phosphoryl transfer reactions". Annu. Rev. Biochem. 49: 877–919. doi:10.1146/annurev.bi.49.070180.004305. PMID 6250450. Mulier, J.C., De Dijicker, F.J., Sansen, V.M. & De Loecker, W. (1982). The effects of electrical currents on ATP generation, protein synthesis, and membrane transport of rat skin, Clinical Orthopedic (171), 264-272. Dommerholt, J., Mayoral de Moral, O. & Grobli, C. (2006). Trigger Point Dry Needling. Journal of Manual & Manipulation Therapy, 14(4). Every horse owner has experienced those seemingly never-ending moments when their horse has become stressed. Scientifically, a horse is perceived as "officially stressed" when the cortisol levels in their blood or saliva increase, and also when their heart rate increases. Behaviors seen in the stressed out horse include actions such as rolling, rearing, barging, weaving, pawing, kicking and specific positioning of the tail, neck, ears and mouth (Oke, 2016). A recent study has re-confirmed the results of another study done in 2012 on the positive influences of lavender aromatherapy on the stressed out horse. According to the newest study, after subjecting a sample of horses to a stressor (in this instance trailering) and then administering them with a 20% lavender oil and 80% distilled water aromatherapy treatment using a diffuser, resulted in a decrease in both cortisol levels and heart rates of the treated horses as compared to the trailered horses who did not receive the treatment. Specifically, according to the researchers, "Both the control and treatment horses showed significant increases in average heart rate and serum cortisol levels when trailered, indicating that trailering is a form of stress on the animals.... Overall, our results show that cortisol levels were suppressed in stressed horses that received lavender aromatherapy... In addition to cortisol repression by lavender aromatherapy, there is evidence of heart rate repression correlated with lavender aromatherapy" (Heitman, Rabquer, Heitmen, Streu & Anderson, 2018). In the similar study from 2012, stressed horses were exposed to humidified air with the same 20% lavender oil treatment and concluded that their results "demonstrate that lavender aromatherapy can significantly decrease heart rate after an acute stress response and signal a shift from the sympathetic nervous control from the parasympathetic system" and also "equine practitioners could use lavender aromatherapy to reduce nervousness among horses in the examination area, or for treatment following performance competition to possibly hasten recovery time" (Ferguson, Kleinman & Browning, 2012). These studies show that using lavender aromatherapy could be a cost effective way to help manage the effects of stress on a horse. Ferguson, C.E., Kleinman, H.F. & Browning, J. (2012). Effect of Lavender Aromatherapy on Acute-Stressed Horses. Journal of Equine Veterinary Science, 33. 67-69. Heitmen, K., Rabquer, B., Heitman, E., Streu, C. & Anderson, P. (2018). The Use of Lavender Aromatherapy to Relieve Stress in Trailered Horses. Journal of Equine Veterinary Science. doi: 10.1016/j.jevs.2017.12.008.